When you’re constantly struggling to find enough home storage space, it may seem like moving or undergoing a costly home expansion are your only solutions to fix the problem. But have you taken the time to thoroughly assess what your home has to offer in terms of its full storage potential? There’s a good chance it has hidden home storage space you’re completely overlooking. Having too little storage space wastes your time due to it being harder to stay organized and clutter accumulating more rapidly. With smaller homes and condos, maximizing your storage space is even more important. Take the time to evaluate whether or not the following hidden home storage spaces can be better utilized to give you more storage options. Upgrading these spaces will create storage opportunities that can be significant or a little less impactful, but every little bit definitely helps. It’s been said that “a spare room is a wasted room”. It’s hard to argue with that belief. One study found that in America alone, there are an estimated 33 million spare bedrooms. That’s a whole lot of wasted space that’s probably holding stacks of useless junk and clutter. Sure, that technically qualifies as storage, but it’s poorly used storage. On top of that, these spare rooms only encourage you to accumulate more clutter. There’s never any urgency to declutter because the room doesn’t have a true purpose or function. Converting a spare room into a useful space that includes extra storage room makes a lot of sense. A guest room, home office, or craft room with built-in storage systems can transform a spare room from useless to truly useful. Another brilliant spare room idea is to convert one into a dressing room (also known as a large walk-in closet). You’ll love the wealth of wardrobe storage space a dressing room provides. This stylish, cozy, and personalized preparation space will soon become your favourite room in the house! Virtually every house has a laundry room, but the degree to which these laundry rooms maximize their storage space varies widely. The fact is that most laundry rooms have lots of hidden home storage space. Exactly where is it, you ask? Start with underneath your washer and dryer. Buying pedestals with storage drawers for these appliances can give you just a little more storage room. Pedestals can also raise your washer and dryer up to a height that’s more convenient for you. Extra laundry room storage could also be included inside a comfortable bench to sit on while you’re waiting for a laundry cycle to finish. A laundry room island also adds hidden storage space for items like a pullout ironing board and laundry supplies, while also providing a handy surface for sorting and folding clothes. 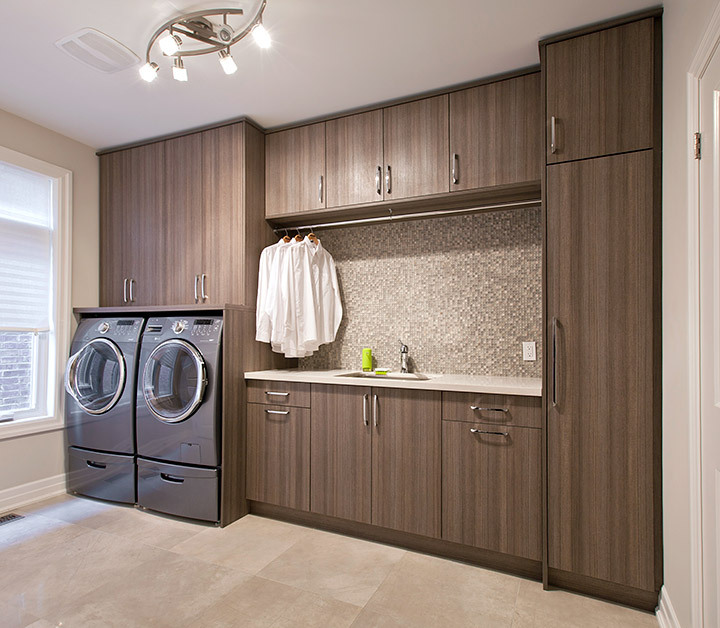 Adding floor-to-ceiling custom cabinetry to your laundry room will make the biggest difference to how functional it is as a storage space. Along with adding extra features like pullouts, hanging rods, and under sink organizers, your laundry room will finally be up to the task of being one of your home’s hardest working spaces. Update your laundry room with floor-to-ceiling cabinetry to optimize its storage space. Most basements offer lots of space that is rarely optimized to maximize your storage space. Too often, homeowners just stack boxes and storage bins in a basement corner. DIY shelving is also commonly found in basements, which isn’t always an ideal solution. It usually doesn’t make the most of your storage space, leaves you with more things to dust, and tends to look rather shabby. Updating your basement’s appearance with bespoke cabinetry will help you to add a little style to this area of your home. You’ll allow this underused space to work a lot harder with effective storage systems that are easy to keep organized. Don’t forget about under your stairs, whether it’s in the basement on your home’s main floor. There are storage opportunities there as well, even if the space is limited and has some rather quirky dimensions. Would you believe there’s hidden home storage space located right underneath somewhere you spend a third of your day? Using under-bed storage is a shrewd way to add extra storage space without adding to the footprint taken up by your home’s storage systems. 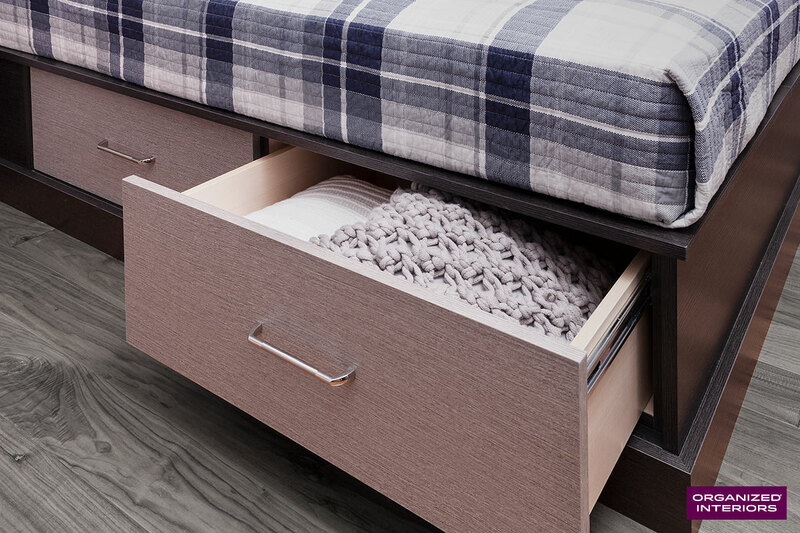 A standalone storage bed or a bed that’s incorporated into a larger bed surround unit provide valuable drawer storage space that can alleviate some of your bedroom’s storage needs. Seasonal clothing, for example, is perfect for storing in your under-bed storage drawers. And here’s a bonus: because under-bed storage leaves no gap underneath the bed, you’ll have about 35 square feet less of your home to vacuum. Because you rarely go up there, you may not even consider the attic as a hidden home storage space you could actually make better use of. There’s no denying that an attic renovation can be a messy and complicated undertaking. It’s probably filthy, hot, may have little headroom, and could lack adequate floor support for walking around or holding much weight. Poor lighting and even having a decent attic ladder might also be issues. That can admittedly be a lot of obstacles to overcome, but it’s also a shame to let so much unused space in your home go to waste. 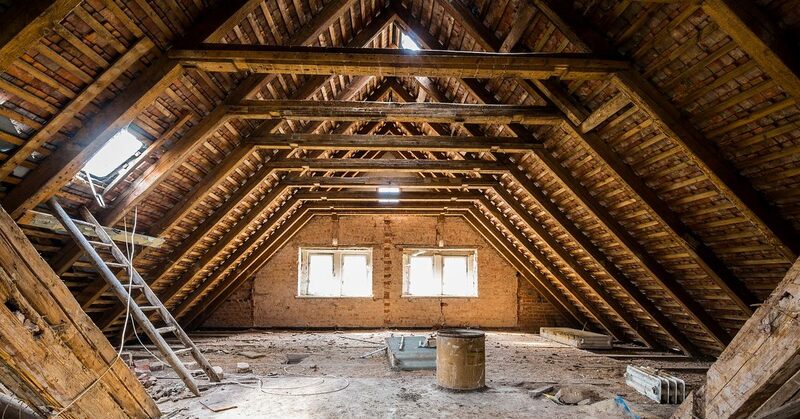 If an attic renovation in your home, however, presents relatively few home improvement challenges, it’s certainly a viable option in order to gain a sizable amount of additional storage space. Fixing up your attic to add storage space can be a lot of work, but worthwhile for the amount of extra storage room it provides. If a large walk-in closet exceeds your wardrobe storage needs, re-evaluate how your traditional closet spaces are being used. With a few upgrades like a custom closet organizer and using the vertical space in your closets more efficiently, you’ll discover your closets contained hidden home storage space all along! If you’re not just struggling with having enough closet space but any closet space in a particular room, it’s easier than you might think to add some. With create-a-closet®, you can add closet storage anywhere you’d like. The garage, like the basement, is an area in your home that’s loaded with hidden storage potential. Garage makeover professionals like Garage Living know that utilizing wall space and overhead space is the key to maximizing a garage’s storage functionality. 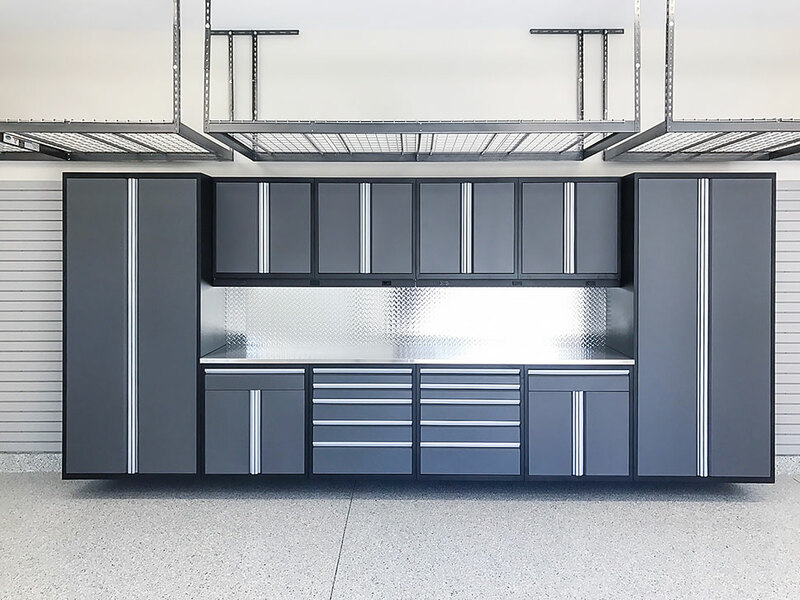 Slatwall, overhead storage racks, and cabinets provide ample room for storing a garage’s contents and items that may be cluttering up the rest of a home. Even an extra vehicle can be cleverly stored in a garage with a space-saving car lift that uses a garage’s empty vertical space. Another thing garages have in common with basements is that homeowners don’t tend to have the same high standards for the aesthetics in these spaces as they do for other rooms in their home. But they’re still part of your home and deserve to look nice. Your garage is loaded with underutilized storage space. Adding a slatwall storage system, cabinets, car lift, and overhead racks maximizes storage space. Take the time to look for it and you’ll find there’s actually ample storage space hiding in plain sight all over your home. For the best personalized solutions that allow you to take advantage of your hidden home storage space, schedule a free in-home design consultation with Organized Interiors.